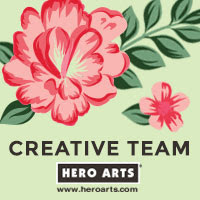 Hello there, today we are celebrating the Hero Arts summer release with a fun blog hop. Let me tell you, the release is amazing. Some of the products are already available at Hero Arts retailers but today the whole release is available to purchase from the Hero Store. If you are following along with the hop, you should have arrived here from the fabulous Tracie Pond's blog. If you get lost along the way, I have a full list of participants below. My card today uses the adorable Believe In Yourself Narwhal. I absolutely love this set, it has a few different narwhals in it, in different sizes plus lots of accompanying sentiments. I started off die cutting a white circle piece using one of the circles from the Nesting Circles Infinity Dies. I then stamped the largest of the narwhal's from the set, as well as the sentiment on to it using Intense Black Ink. The Narwhal was coloured using Copic Markers and then I added in a sea background behind him, also with Copic Markers. The panel was added to a larger white cardstock circle with foam tape. This was then added to a circle card base with ATG. To create the circle card base, I took two circles that I again, die cut with the Circle Infinity Dies. I added a score line to one of them at the top to create a flap. This piece was adhered to the other with strong tape. I then cut a little sliver off of the bottom of the circle to aid with standing the card up. To finish off the card, I added clear YNS gumdrops. COPIC MARKERS: Narwhal - T8, T7, T6, T5, T4, T3, T2, T1, T0, R000. Sea/water - B66, B63, B21, B12, B00, B000, B0000. 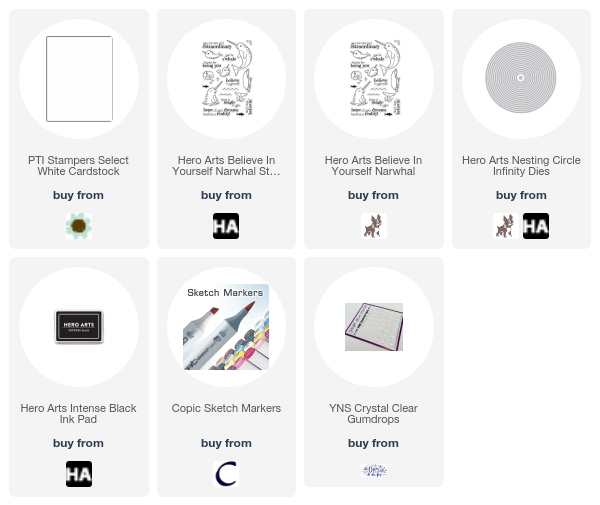 Hero Arts are giving away three $25 shopping sprees, drawn from the comments left across all blogs in the hop. Please leave a comment by Wednesday 24th May 2017 at 11.59 PT and the winner will be announced the following week. The next person on the hop is the fabulous Heather Ruwe. Thanks so much for visiting me today. I hope you have a great rest of the day! Such a cute card!!! LOVE that background! Makes the sweet narwhal POP. The ocean you created is gorgeous and shows off the the handsome narwhal! Great card. Love this stamp set. I am having such fun on this hop. The circle card base complements the Narwhal perfectly! Love this Narwhal - he just makes me smile. And the background you created is beautiful! Your Copic colored sea background is fabulous. It looks simple but has such depth. So cute and your background is just beautiful. Wow, your Narwhal is gorgeous! This is so cute. These little guys would be cute with the whale and turtle. Adorable card ! Love the sea background and your coloring is superb ! Michelle, what a beautiful card and I love your use of colors. It is so well thought out! Thank you for sharing! It is fun to see all the different ways to make a sea background. Sweet card. 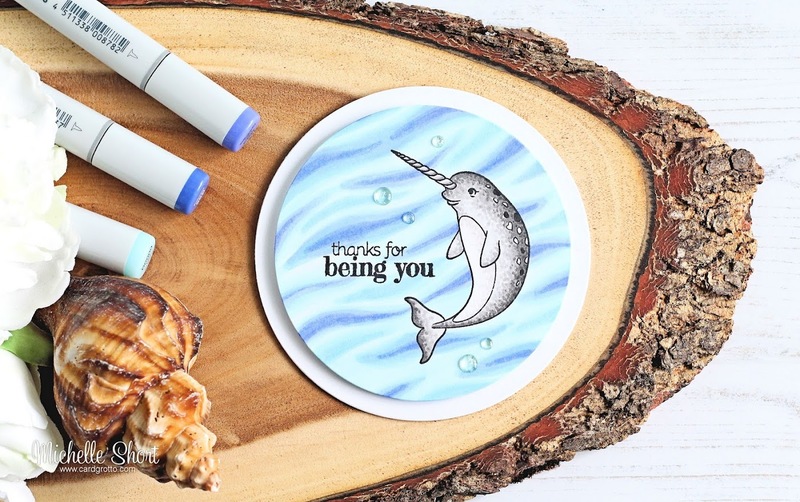 Love that narwhal and the sentiments that go with that stamp are so positive. And love the background. Thanks for sharing! Isn't that an adorable card! Love the copic colored background! will have to try that! The sea background you made is absolutely amazing! Thanks for sharing! Sweet card. Love the background. I want to see how you did it! Absolutely love the sea background! The Narwhal is pretty cute and I love your background Michelle. Love the shape of the card and your coloring! What a cute card!! Anyone would love receiving this! It would definitely bring a smile! I like the round card shape with the narwhal on it. Cute! Love your background on the one. Thanks for sharing. 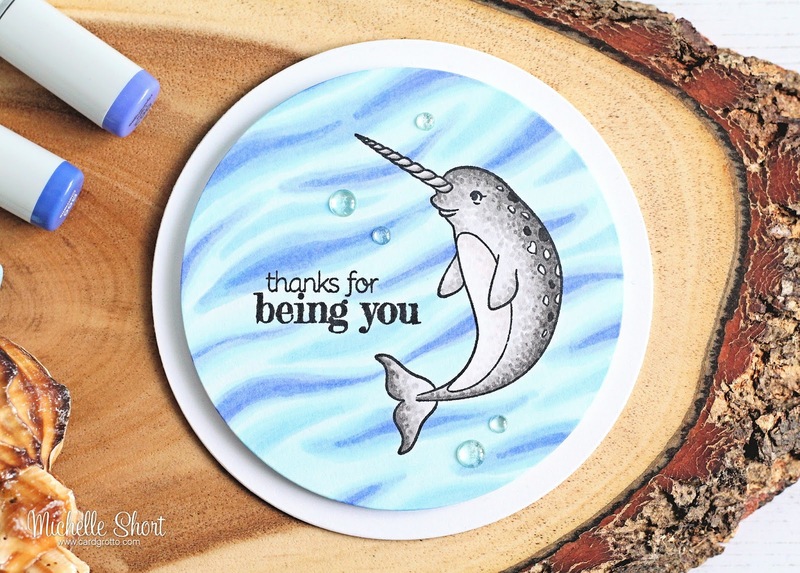 The narwhals are super cute and look super fun to color and the sentiments are adorable!! Love your circle shape card. So cute and amazing Copic colouring of the background waves. 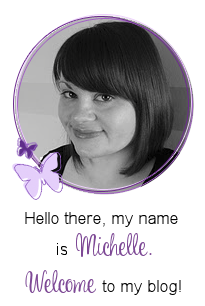 Oh my gosh, your background looks amazing, Michelle! I love how you colored the Narwhal, too...such great details! I never even thought to make a round card, thanks for the inspiration! What a cute card, just love it! Just love the round card and what a wonderful design and sentiment. Love the background you created with Copic markers! Very Pretty! Your background is breath taking. You did a fantastic job. Wow! The background is stunning!! Such a beautiful card. Cute Narwhal. You gotta love a narwhal! Your card is so cute and I love the background. So cute! I want to do a unicorn and narwal with horns touching like an Eskimo kiss card. The narwhal is as sweet as can be, but your sea background is amazing! You have mad skills - thank you for sharing! I love shaped cards. Great background!! Perfect whale and terrific sea - love the coloring! Your background is so realistic. Love this card. Super duper background! Thanks for sharing your talents! Love this cute card! thanks for the inspiration. Your cards is so cute! Thank you for sharing your card for inspiration! Love the circle shape card with this design. Love the narwhal. The detail on the back is great. Thank you for sharing. Simple, but such a fun card! Great work. Great card! The narwhal is really cute. Love your card. Great presentation. Nice examples! Keep up the good work! Wonderful card. Love the water background. Very creative and fun image. Love this fun stamp set and what you created with it! Love the cute Narwhal and the way you did the water. Great card. Very sweet card--and the background is terrific!! Love what you created; you are so talented. Great background and narwhals are just fun. I love the circle card - great background too!! This is a wonderful release, thanks for the inspiration! Love the background. Shaped cards are always intriguing. Love the background and how you created it. Cute narwhals, and a great release. That water looks absolutely amazing!!! Perfect card with that background! Ohhhhh love that seawater background!!! Love that round card. I'm going to try that one of these days. Beautiful Copic coloring! Thanks for sharing! Absolutely adorable card. This is such a wonderful release. The background you created was perfect for the narwhal. Thanks for sharing this great card. Very cute. Love the color of the water. I love how you colored the Narwhal and the background! Such a cute card and love the sentiment. Thanks. The sea background is beautiful, perfect for your narwhal! Sweet, love the background and the circular card. Awesome background on this pretty card! Cute card. I love the blue background. It makes the narwhal stand out. Would love to see how you did that background .. It's amazing.. I love circle cards, they are so unique. The narwhal is a beautiful creature and deservves a beautiful setting like this. Such a cute card Michele O love the narwhal! Oh so pretty! I love the coloring on this card! Wow! Your background is absolutely amazing! I would love to see a video of how you created it. Beautiful card! What a lovely sea background! You really did a great job with this card. I love the little narwhal and the fact that you used a circle card! I'm going to have to try that. Love the background you created for this narwhal. Thanks for sharing your gorgeous card. I love the background you made. How fabulous your 'star of the stage' narwhal is! Such a pretty ocean-themed card! The water has so much movement. Great card, great coloring! Thanks for sharing! I really like how you created the background for this guy. Such gorgeous coloring! I love the background behind the narwhal. How did you achieve that effect using copic markers? wonderful fun and cut card. Love the colors and Love the new Collection, Thank you for sharing. Your lovely work put a smile on my face! Loving the colours in your card. Thanks for the lovely inspiration. Funcard all around. I like how you created the water. Cute stampset and I love the way you made it as a stand up. Very cute! Shaped cards are the best! Your background is fabulous! It suits the little whale so well. The beautiful coloring on the background really lets the narwhal shine, I love it! Very sweet narwhal...love your great colouring! Lovely card 💙 and nice wave background. This is an inspiring card for any receiver of it. So Cute! I LOVE Hero Arts, thank you for the opportunity to win! Awesome card! Love the gorgeous background! Your card is darling! Love how you did the background! Oh beautiful work! Love your artwork! Hey Wow! I love this round card! So watery! Your copic coloring of the narwhal and the sea is spectacular!!! This Hero Arts release is amazing! Loving this blog hop with all it's talent and inspiration! Thanks for sharing yours! Adorable card -- love the shape, the background and the narwahl! Now I have never heard of a narwahl -- do they really exist? I fell in love with Narwhals a few years ago watching a show on the Discovery channel and was tickled pink when I saw this set! It is definitely at the top of my must have list! Your card is adorable! TFS! Your background is just amazing and I love the shaped card - so different than the typical card. Your color scheme is so relaxing and calming too! Super cute and fun card Michelle! I love your waves! Your card is so cute and encouraging. I never the real name of these unusual sea creatures. Your card is incredible! Love the background you made! Superb card, Michelle, and the background is amazing! Beautiful card, thank you for sharing with us! Sweet card. Love how you created the ocean background. Just a beautiful card! That ocean background is stunning. Just love it, thanks so much for sharing! OMGosh, what an amazing background! Love it.